This is the Academy of the IKV Melota. This is where you will find useful information on HOW TO to many of the things that we assume are regular processes for our ship. "Bloodwine", in quotation marks, is what this page is about. Luckily, none of the episodes have explained what is in "bloodwine". This allows any of us to make something up and have it work. I have heard of punches, mixes, sangrias and stuff being used as "Bloodwine". I have heard of all kinds of things used or mixed in a bucket to be "Bloodwine". Most ships basically have a Ship's Mixer that goes to the Likker Store and then mixes a "Bloodwine". Whatever you want to do, power to you. We in the Cold Revenge Quadrant take time, care and craft brew a "Bloodwine". I hear (more often that you an imagine) suggestions from non-brewers ideas about using actual blood and brewing a true bloodwine. Don't even go there. Brewers understand the nature of brewing and won't try it unless they are really trying to make a novel item just to say that they have done it, and to then pour it out. There are serious technical reasons why this won't work very well. Then, there are the health issues about handling blood in this century. As a real brewer, and not a "mixer", I brew the "Bloodwine" for the IKV Melota. My first batch (Spring 2002 Tournament) was actually a gaslocked wheat beer with grenadine syrup added for color. Since then, my "Bloodwine" has been apple cider with grenadine syrup added for color and flavor variation. This is what I recommend since it is cheapest and easiest to brew if you intend to BREW as opposed to mix. This page is to teach anybody how to brew apple cider. Just follow the directions and you will have 1 gallon of apple cider in about 6 weeks. Make sure that you read and understand these directions to know how and when to purchase what. 0.2 Drink said apple cider/juice. 0.25 Choose your choice of sterilizing fluid. Bleach works but takes a lots of rinsing. I prefer to use Iodine. 0.4 Goto the same store and acquire a matching gallon jug of apple cider/juice. 2 Cover the top of the jug with a clean, dry oversized plastic cup to avoid airflow and fallout. 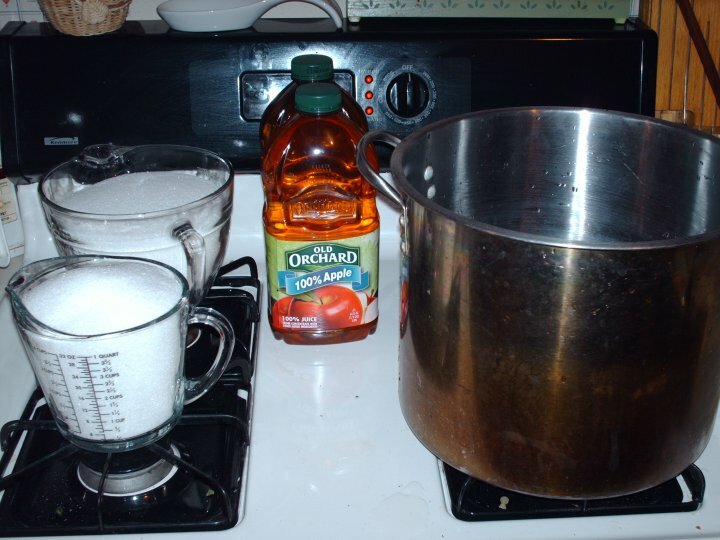 3 Pour your apple cider/juice into a large pot and heat it to a minimum of 150 but never over 175. 4 While heating place your stopper and disassembled gaslock into the sterilizing fluid to wait there until we need them. 5 Place a little bit of water in the microwave and nuke it till it boils hard. Let it cool in the microwave until we need it. 6 Once at 150 stir in your sugar into the apple cider/juice to allow it to be sterilized. (.5 cups for dry to 2.5 cups for sweet cider/juice) Once you stir in the sugar put the stirring device in the sink to prevent casual re-use / contamination. 8 Once it is cool enough to return to the jug, then rinse out your jug thoroughly to eliminate any sterilizer left in it. Shake out any excess water too. 9 Pour your now cooled cider/juice into the jug. Remember to sterilize your funnel (if used). 10 Quickly rinse off your stopper and gaslock, again shaking any water off of them. 11 Assemble and "cork" the jug. Do NOT water the gaslock. DO put an oversized plastic cup over it to prevent airflow and fallout while there is no water in it. 12 Allow your mix to reach room temperature. 13 Once at room temperature, sterilize your yeast packet and fingers with an alcohol swab. Do this as if your were about to take/get an injection. 14 Carefully open the bag and pour into the cider/juice avoiding the sides/throat of the jug. (actually, there is enough in the bag for 5 gallons, so I just pour a little and run the risk of contamination when I do my next batch.) Return dry gaslock to "stopper" the jug. 15 Take your water out of the microwave and pour into the gaslock just enough for it to operate correctly. 16 Mark the jug with the date 6 weeks from now. If today is Feb 27, then it gets marked April 10. That last sentence has a lot packed in it. Your gaslock will probably froth and blow through making a mess at first. The object here is to keep the gaslock as clean and sterile as possible so that when the "blow through" is over, the gaslock is cleaned and operating to allow CO2 out and nothing back in. You can carefully decant the cider/juice but that usually still winds up getting sediment back into the cider/juice. I recommend getting an actual syphon tube from your brewshop and using it. Remember to STERILIZE everything that touches the cider/juice. You can place it into another jug or bottle it. Bottling requires having bottles, caps and a capper. I recommend just keeping it in a jug and pouring whenever you want some. Understand that you are bottling a very LIVE mixture. The yeast shall generate CO2 over time. That means pressure. If you bottle without understanding the ramifications, you will get the phone call from a friend, or suffer yourself, the energetic disassembly of a bottle. Experience has shown me that you MUST keep a gaslock on the jug. Also, for me, if I actually use a screwcap, somehow the cider gets infected. Actually, I think that that infection is "mother of vinegar". I did not wonder about this until years later and now am failing at making vinegar on purpose. Take Nomad's advice... "Sterilize! Must sterilize! It really is this easy. I like to keep a batch going at all times that way I have a good cider either going or finished at any time. So, I generally have 3 cider jugs. The one fermenting, the one in a post fermented holding pattern (aging), the one that I am actually tapping. The above are my original and basic instructions for an apple cider. When it pretty much finishes bubbling, it is done. Then, there is the question about it being too dry or too sweet. Those are personal preferences. We like it sweet. So, if it is too dry, add more sugar when you pour a cup. (short term solution) Or, add more sugar and let it ferment again. Keep adding each time it quits and is too dry until you finally reach the capacity of the yeast. Then, you can add more sugar without it starting again. 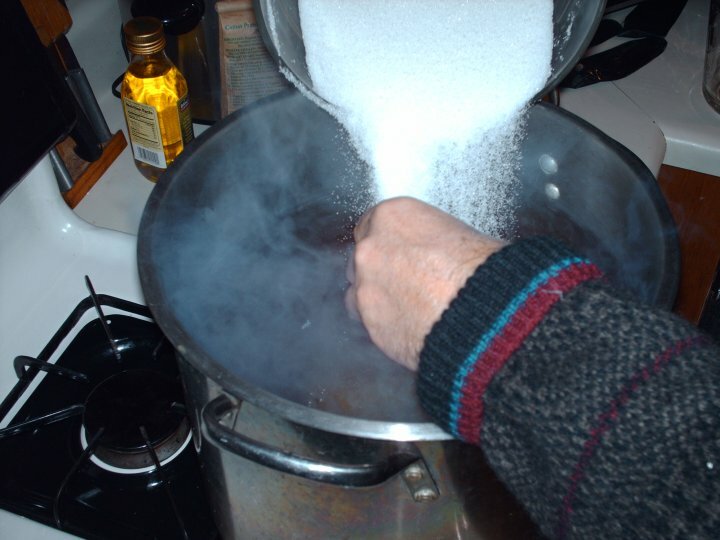 (longer term solution) By keeping records of the additional sugar, you then have the information you need to put in the correct amount of sugar the first time. The above effort may seem silly when you can simply buy sodium bisulfite to kill the yeast. Now ask yourself, "How many Warriors do I know that are allergic to bisulfites?" Make DAMN sure that you know the answer. For those of us allergic, and I am one, it is a bad medical situation getting handed a cup of bisulfites. Where this adjustment matters is personal preference as I mentioned. But, it factors in to the "bloodwine" mix. Since I add grenadine syrup to the cider to color it and give it a bit of a non-apple flavor, that adds sweetness. Therefore, you want to have a slightly dryer base cider to which to add the grenadine syrup. This is a trial and error proposition that you learn over time. Since I and my parmachai like sweeter ciders, I am using 3 1/8th quarts of sugar per 5 gallon batch. This is the same as 2.5 cups per gallon. Buying bulk, a 10 pound sack of sugar is fairly close (about a quart over) the target amount. The instructions are pretty much the same. However, you are using only water and honey, no apple juice, and no sugar. You should use 3 pounds of honey per gallon of water for a dry mead. Otherwise, use 5 pounds per gallon for a sweeter mead with a lower octane rating. Once you have some experience behind you, consider throwing in cinnamon sticks to the brew. Experiment later with other spices. You want processed, mechanized, mechanically abused honey. The purer the honey, the more likely that the natural antibiotics in the honey will stop your fermentation. Buy that nice, commercial, blended, brand named honey. I still have those three jugs going, however, they are 5 gallon carboys instead of 1 gallon jugs. If you are dumping 2.5 gallons at a time into the bloodwine bucket for dipping at Ceremonies, you must brew in larger quantities. 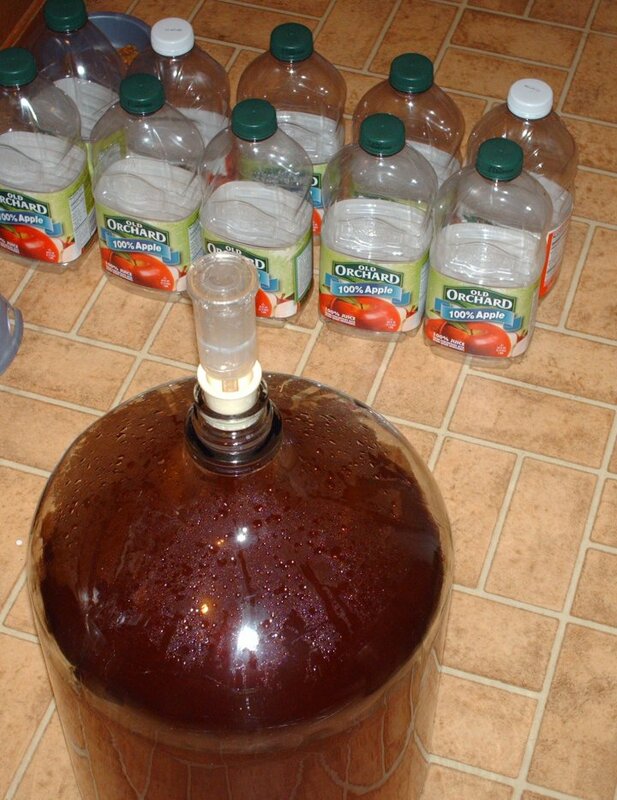 Simply multiply my above figures by 5 if you are using a 5 gallon carboy. 6.5 if you are using a 6.5 gallon bottling bucket. All of these plant assets, carboys, buckets, gaslocks, can be purchased at any homebrewing supply store. You may use a bottling bucket to bottle, or to get past that first "blow the gaslock" stage. But, use GLASS for the actual longer term fermentation or aging. The plastic of a bottling bucket will alter the flavor. The next item in the brewing category is the Firewine.